Trisha Krishnan, born on 4 May 1983 is a south Indian actress. She has also done some Bollywood movies and is mainly known for her role in the movie Khatta Meetha opposite Akshay Kumar. Trisha’s strong features are her beautiful smile and an innocent face. Most South Indian actresses often step out without makeup, unlike the Bollywood actresses. Here are some pictures of Trisha without makeup. This is one of the cutest pictures of the actress. Here, Trisha doesn’t look perfect like a celebrity. Stepping out without makeup, she proves that no one is perfect, not even celebrities. And she is surely not afraid to show her real face to the world. She looks just like a regular girl next door without makeup. In the second picture, Trisha’s face looks completely bare without makeup. A little tinted lip balm would have rescued those pigmented lips. Here Trisha is seen in a funky outfit. She is using her stole as a head band. It does look a bit 80’s, but she still looks nice. A picture of Trisha Krishnan without makeup taken at her house, looking starry eyed at the lens. The photographer must have been delighted to click her. Those black shorts show off her perfectly toned legs and the loose t-shirt confirms her love for comfort dressing. 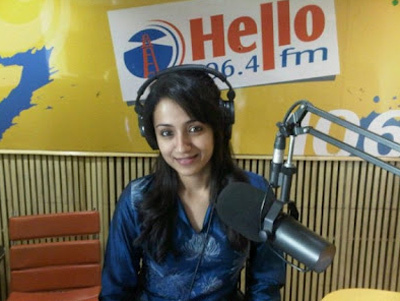 In this picture, Trisha is without a trace of makeup. But her look is still bright and her face glowing. Her smile is truly beautiful here. This is an old picture of Trisha’s. Notice how she looks leaner and younger in this one compared to her recent pictures. The dress she’s seen here in is quite out of fashion now. The above picture was taken during her yoga session. Even with no makeup, Trisha looks confident. Her bright green T-shirt implies she isn’t afraid to go bold with colors. The red hair band is a smart exercise accessory. The Khatta Meetha girl came dressed in a simple blue kurti sans makeup for a movie promotion at the Hello96.4 FM studios. Her skin looks flawless and devoid of any blemishes. Here Trisha looks simple yet sweet. It’s proven that she doesn’t need makeup to look good. Her hair is tied back in a simple pony with a few bangs on the side. This south Indian beauty never seems to disappoint us. She’s dressed in casuals in a loose blue t-shirt and matching cap. Her hair is straightened. These are our favorite Trisha photos without makeup. Now that you’ve seen these images, do you think she can pass of as a beauty even without makeup? Share your thoughts in the comments section and let us know.